The relentless march of digital technology is transforming the competitive landscape and redefining both the work and workforce. New digital business designs demand new talent strategies, yet it feels as though HR is always behind, always in reactive mode, always fighting the last battle. 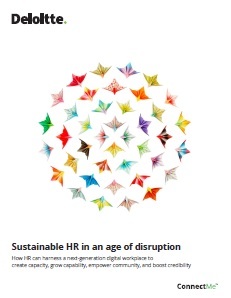 How can you create sustainable HR in an age of disruption? Deloitte has put together this use-case examples and research hypotheses that point the way forward for our own digital workplace journey. We trust that you will find our experience enlightening and discover ways to leverage our hard-earned insights into your own vision for a digital workplace-powered future.